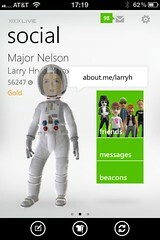 Xbox LIVE has released the official Xbox LIVE app for iOS owners. This is a universal iOS app. Also, yesterday, we introduced the Xbox Companion for Windows Phone 7, which has even more features than the iOS app. You can see details and download that free app here.